J.D. Platt's K9 Kings Entertainment, As seen on "Greatest American Dog"
Komfy K9 has been a labor of love over many years of development. The ideas was created in part with the collaboration of our beloved family dog of 14 years Sarah. Sarah injured her back and became paralyzed at the age of 14. During her recovery from surgery we spent time at the clinic with her and saw the great need for Komfy K9. We watched vet technicians change bedding over and over again in the same kennel and finally completely remove any bedding form the kennel. It was heartbreaking to watch the patient be forced to lay on the cold hard steel of the kennel floor, but it was obvious that due to the time it took to clean the large quilts and towels there was just enough time to keep repeating this process. We realized there was a real need to creat kennel bedding that was easy to clean, disinfect and would also provide ultimate comfort and support for clinic patients. The idea of Komfy K9 was born, and the finished product has been years in development. We have worked closely with an excellent veternarian clinic that provided feedback on what worked and did not work as we produced countless prototypes for them to test. Ultimately we achieved the bed that was easy to clean, sanitize and allowed the technicians to meet the needs of their patients without compromising their quality of care. Petcurean is an independent, Canadian-owned and operated family business that's been around since 1999. There's something about having our head office surrounded by someofthe most fertile ranching and farming lands in Canada that inspires us to develop and produce the best pet food we possibly can, using only premium-quality, market-fresh meats, veggies, fruits and berries. Our production ingredients come from a trusted network of producers, who are as close to our production facilities as possible, which helps ensure freshness and minimize the environmental impact of transportation. All of our recipes are conceived, created and formulated in Canada; all of our dry pet food is Canadian made; the majority of our canned recipes are produced in Canada, and a few others are produced at a facility in the USA. Through all our adventues growing up in the west, the members of the Wolfgang team were constantly flanked by faithful, loyal and furry best friends. While we were fishing, climbing trees, building skate ramps, or hanging out at home watching TV, those dogs were there as our partners, our guardians, our shadows. Neither they nor we would have had it any other way. Career-wise we're all product guys, having been responsible for bringing thousands of products of all descriptions to market. Headphones to hoodies. Backpacks to boom boxes. Watches to wallets. Headwear to footwear. We've been lucky enough to work on some very cool products over the past couple decades. As we laid the plans for what would become Wolfgang, we sought to combine two of our favorite things; our beloved dogs, and the process of creating world-class products. Wolfgang was created to celebrate the unique relationship between a dog and his people. We offer American-made leashes and collars for your pup using only the finest American leathers and textiles, plus a distinctive collection of wallets, belts, t-shirts and hoodies for you. We build our products locally, transport them minimally, and they'll be replaced rarely. It all began in 1952, in a little western town called Prineville, Oregon, where an enterprising young man named Les Schwab started out with one small tire store. From the get-go, he recognized that anybody can sell tires: it was earning customer trust that takes more. Les’ vision for his company was built on principles that still guide what we do. Give honest advice on what’s really needed. Do the job right the first time. Stand behind all you do. Share in the success with employees. This service ethic is what’s behind the growth Les Schwab Tire Centers® has enjoyed over the course of more than 60 years. With over 450 locations, we’re one of the largest independent tire dealers in the country. And we’re like no other. XTRA XTRA! Read all about it! 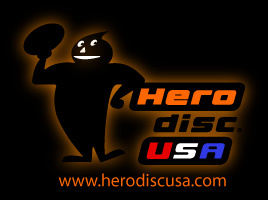 Hero Disc USA is excited to release the Hero XTRA-235. The XTRA -235 weighs in at 105 grams which is very close in weight to our Air model. We added a special compound in our plastic that gives the XTRA � 235 more grip which is ideal for wet conditions. The Hero XTRA-235 also has enhanced durability ensuring more play time with your favorite companion. You can mix disc colors and different models (like the SuperHero, SuperStar, SuperSwirl and Hero Air) to get to the quantity discounts. The XTRA is also available for custom hot-stamping! ORDERING TIPS: Combine regular K-9 discs and our new Super Models to achieve quantity discounts. (excludes 160 and 120 Pup discs) Please contact our staff with any questions. Hero Disc products offer the highest quality and performance in the market. The following organizations have enthusiastically welcomed and accepted for play in their events the Hero Disc line. We thank you for your support and we look forward to seeing you and your dog enjoying your time on the field or in the yard. Bring out the Hero in your Dog! To provide the best in animal health care through state-of-the-art knowledge and technology combined with experience, practicality and informed client participation. Maintaining a highly skilled and dedicated staff to assure that both our clients and patients receive the thorough, individualized and personal attention they deserve. A doctor-client partnership in animal care based on confidence, trust and personal communication. Reliable availability of doctors for consultation, appointments and emergency care. Continuing education for doctors and staff and ongoing investment in technologic innovations for diagnosis and treatment. Consultation with board certified specialists and referral when needed. Utilizing only the highest quality vaccines, pharmaceuticals and nutritional therapeutics available.